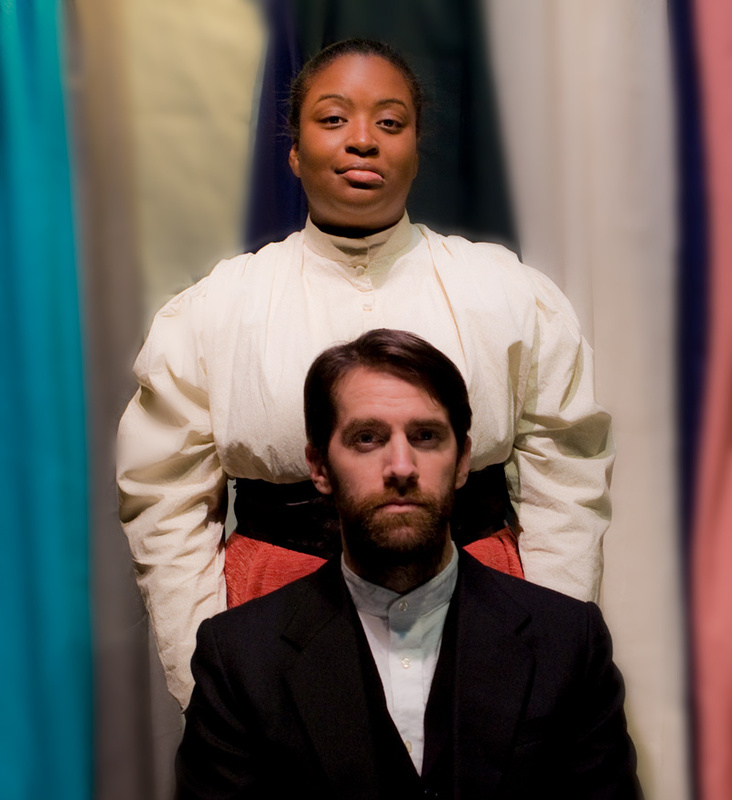 Lynn Nottage’s title, Intimate Apparel, sounds like it may be an advertisement for Victoria Secret, but that only scratches the surface of the material central to this play as Pear Avenue Theatre’s production explores many levels of intimacy beyond the clothing. This is a play about friendship, love, marriage, class, race, and yes, hand-crafted intimate garments. The story is set in 1905 New York and in Panama. Esther Mills (Alicia Stamps) is the central character and is a seamstress who makes lingerie and corsets for a diverse clientele ranging from aristocrats to working girls. She rents a room in a boarding house owned by Mrs. Dickson (Kendra Owens), a woman she’s known ever since she traveled north to New York. Mrs. Dickson has become both her landlord and a somewhat judgmental, yet helpful friend. Esther’s clientele includes the mildly alcoholic Mrs. Van Buren (Maggie Mason), an uptown socialite who has a tenuous relationship with her husband and confides in Esther. Another close friend and client is Mayme (Yha’ Mourhia D. Wright), a cynical, yet spunky prostitute with a soft spot for Esther. Mr. Marks (Jarrod Pirtle) is a Chasidic haberdasher who works out of his flat and has a forbidden fondness for Esther as he saves the finest silks, satins, and lace for her each time she visits. Along the way, George Armstrong (Michael Wayne Rice), a Barbadian immigrant, courts her from the Panama Canal through beautiful, romantic letters. Although the entire play takes place in several bedrooms, the story is tastefully told. The only truly bawdy moment is a playful song sung in celebration as Mayme and Esther toast Esther’s impending nuptials. Ron Gasparinetti’s set design makes good use of the Pear’s intimate performance space sporting a four poster bed and a piano stage right; a door upstage left; and some hanging shelves and a table, along with a sewing machine stage left. A scrim above the door covers a second story platform that serves as a thought bubble and as a screen for period, street-scene projections clarifying the specific locations within the play. Director Troy Johnson makes excellent use of his strong cast and colorful set. The platform behind the scrim is used for George to stand atop as he personifies the vision in Esther’s mind while she imagines him reading his letters to her. Johnson’s staging is both creative and economical in its space demands using actors to move the sewing machine and change bed coverings to match the locale. The bed coverings range from a crazy quilt in Esther’s room, to a muted maroon and tan spread in Mrs. Van Buren’s room, to a flamboyant red in Mayme’s boudoir. Johnson also formulates two notable montages. The first surrounds the action moving into Esther and George’s wedding at the end of Act 1. The second occurs early in Act 2 as they come out of the wedding night superimposing action across locations. As written, the scene changes should all be fluid, seamlessly transitioning from one location to the next. The only negative aspect of the staging is that some of the scene changes stall the action slightly as the small furniture moves are done serially rather than in parallel with the bed redressing. The change timing should speed up as the run continues. Stamps portrays an Esther who seems at first resigned to her station in life, and while not outwardly depressed, she is very matter of fact and doesn’t smile easily. Stamps clearly has the chops for a much larger venue, and her presence initially seems a bit bigger than life in the small space. As her character’s long distance romance develops, Stamps opens up and becomes much warmer and more vulnerable. Pirtle is very likable as a man beholden to his Orthodox Jewish traditions as he struggles with his forbidden attraction to Esther. He has the little things down such as his subtle primping when Esther enters his flat. He and Stamps are tender in their scenes together, their characters aware of the social taboos against their friendship while visibly unable to constrain their feelings for one another. As George, Rice approximates the sing-song cadence of the Barbadian speech pattern, although his resonant diction is a tad too choppy. He successfully changes the cadence just a bit between his Act 1 imagined speech and his Act 2 reality. Rice and Stamps work reasonably well together. Early on, Rice’s urging plays nicely against Stamps’ tentativeness on their wedding night, but their friction later in the story moves rather slowly and drags a bit. Owens is the stand-out performer enjoying the audience’s rapt attention with each entrance. Attired in a regal purple period dress, her elegant bearing and ease of dialogue delivery make her portrayal of Mrs. Dickson both riveting and believable. She delivers her comedic lines with perfect timing, and she displays a distinguished eloquence in her impassioned monologues. She’s smooth, glides easily across the stage, and serves as a mother figure. Dickson is clearly fond of Esther, and she wants to help guide her to a better life. Wright too is notable bringing a youthful exuberance to her Mayme. She’s simultaneously a good friend to Esther and a competitor, at times reveling in being the “bad girl”. She moves fluidly as she swoops through her boudoir. Wright is not a performing pianist, but as Mayme, she has to appear to be playing at times, and she matches her movements to the music rather well. As a socialite, Mason’s Mrs. Van Buren shouldn’t befriend someone of Esther’s status, and yet she’s drawn to her. Mason’s portrayal convincingly alternates between slight mania, her character intoxicated both by liquor and the forbidden friendship, and despair in her character’s loneliness. Sound designers Jeanie and Gordon Smith have pulled together a lovely collection of period piano music built around ragtime themes that’s used both as a plot point from Mayme’s background and to cover scene changes. The music never intrudes, but it is plentiful and serves the story well by setting the mood. Sara Sparks does double duty as both stage manager and lighting designer. Together with Johnson’s creative staging, Sparks’ lighting design helps to accentuate subtle differences between the bedrooms in which the story unfolds. Patricia Tyler’s costumes finish the picture, each in glorious detail from the gorgeous period dresses to the tailored details on Mr. Marks’ suit and Orthodox trimmings. A particularly striking piece is the smoking jacket that Esther makes from the fine Japanese silk Mr. Marks sells her. This is a strong production that draws you in and moves you as it shows the depth and importance of true friendships. The Pear’s Intimate Apparel is a play that shouldn’t be missed. When: Continues through 27 January 2013, Thursdays-Saturdays at 8PM, Sundays at 2PM.